A tiny fraction of meteorites on earth contain strikingly beautiful, translucent, olive-green crystals embedded in an iron-nickel matrix. Called pallasites, these "space gems" have fascinated scientists since they were first identified as originating from outer space more than 200 years ago. Now a new study published this week in Science (Nov. 16) shows that their origins were more dramatic than first thought. Using a carbon dioxide laser, a magnetic field, and a sophisticated recording device, a team of geophysicists, led by John Tarduno at the University of Rochester, has shown that the pallasites were likely formed when a smaller asteroid crashed into a planet-like body about 30 times smaller than earth, resulting in a mix of materials that make up the distinctive meteorites. 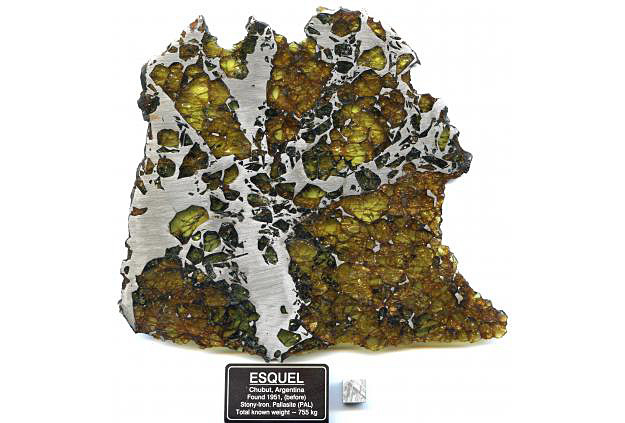 "The findings by John Tarduno and his team turn the original pallasite formation model on its head," said Joshua Feinberg, assistant professor of earth sciences at the University of Minnesota, who was not involved in the study. "Their analysis of the pallasites has helped to significantly redefine our understanding of how these objects formed during the early history of our solar system." Pallasites are made of iron-nickel and the translucent, gem-like mineral olivine, leading many scientists to assume they were formed where those two materials typically come together--at the boundary of the iron core and rocky mantle in an asteroid or other planetary body. Tarduno discovered that tiny metal grains in the olivine were magnetized in a common direction, a revelation that led the researchers to conclude that the pallasites must have been formed much farther from the core. "We think the iron-nickel in the pallasites came from a collision with an asteroid," said research team member Francis Nimmo, professor of earth and planetary sciences at the University of California Santa Cruz. "Molten iron from the core of the smaller asteroid was injected into the mantle of the larger body, creating the textures we see in the pallasites." "Previous thinking had been that iron was squeezed up from the core into olivine in the mantle," said Tarduno. "The magnetic grains in the olivine showed that was not the case." In order for the metal grains--located in the olivine--to become magnetized, there had to be a churning, molten iron core to create a magnetic field. And temperatures at the core-mantle boundary--which would have been close to 930* C--are simply too hot for magnetization to take place. That means that the pallasites must have formed at relatively shallow depths in the rocky mantle, where it was much cooler. By using a carbon dioxide laser at the University of Rochester, the scientists were able to heat the metal grains past their individual Curie temperatures--the point at which a metal loses its magnetization. The grains were then cooled in the presence of a magnetic field in order to become re-magnetized, while a highly sensitive measuring instrument called a SQUID (superconducting quantum interference device) was used to record the values. In that way, the research team was able to calculate the strength of the past magnetic field, and then determine the rate of cooling using prior published work on metal microstructures. "The larger the parent body was, the longer it would have taken for the samples to cool," said Nimmo. "Our measurements, combined with a computer model we developed, told us that the parent body had a radius of about 200 km--some 30 times smaller than earth." The measurements helped the scientists to classify the parent body of the pallasites. Tarduno said a 200 km radius made the body large enough to be considered a protoplanet--a small celestial object with the potential of developing into planets. Their work also helped clear up questions about whether small celestial bodies were capable of having dynamo activity--a rotating, liquid iron core that can create a magnetic field. "Our magnetic data join mounting evidence from meteorites that small bodies can, indeed, have dynamo action," said Tarduno. The research team also included Rory Cottrell, Julianna Hopkins, Julia Voronov, Austen Erickson, Eric Blackman, and Robert McKinley in Rochester, and Edward Scott at the Hawaii Institute for Geophysics and Planetology.